Bloomberg reports that former top adviser to President Trump, Steve Bannon has been meeting with Henry Kissinger to discuss China. 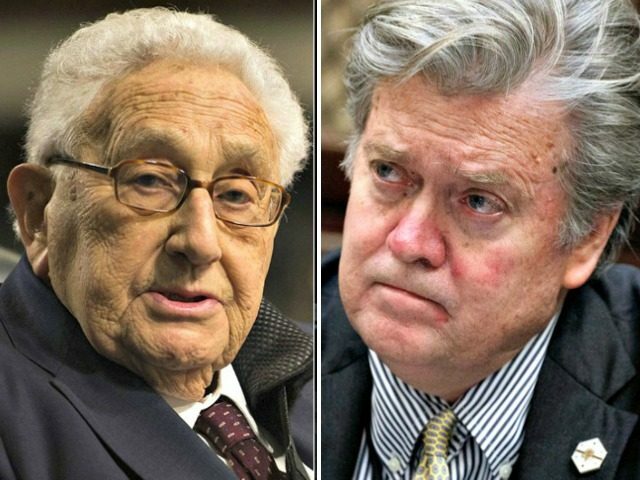 Bannon's media outlet, Breitbart, says Kissinger and Bannon have started a project to sound alarm on China. “If we don’t get our situation sorted with China, we’ll be destroyed economically,” Bannon says. Bannon and Kissinger both think in terms of nationalistic aggregates and have no basic understanding of free trade. I am not surprised the two are meeting. They are both economic ignoramuses. A new world war is possible as long as there are economically clueless such as Bannon and Kissinger close to power, advising power moves against other nations instead of encouraging a movement toward more free trade. "a way to avoid it, by means of an economic alliance" What does this mean? An alliance with who? China? or K+B? Kinda ambiguous.